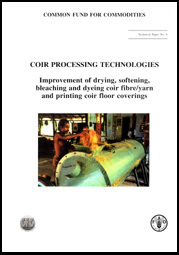 Cover photo: Fibre drying trials under way at Lunuwila Sri Lanka with the equipment designed and developed by the Coconut Development Authority, part of the CFC-financed project "Coir Processing Technologies". J. van Dam, ATO bv, Wageningen, the Netherlands. The views expressed in the paper are those of the author and do not necessarily reflect those of the Food and Agriculture Organization of the United Nations and/or the Common Fund for Commodities. The designations employed and the presentation of material in this information product do not imply the expression of any opinion whatsoever on the part of the Food and Agriculture. Organization of the United Nations or the Common Fund for Commodities concerning the legal status of any country, territory, city or area or of its authorities, or concerning the delimitation of its frontiers or boundaries.